who can beat a good japanese flea market by the light of kerosene lanterns? i'd heard (or read) there was a flea market near tokyo's ueno park, but i wasn't quite sure how to find it. 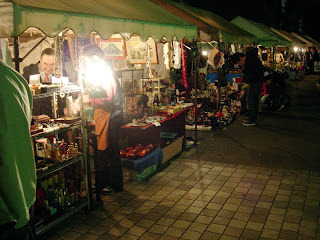 considering how big ueno park actually is, and how late a start i got today, i was surprised to round a corner and find these sellers still in their booths after dark. lots and lots of great stuff. i refrained, however, from spending too much.